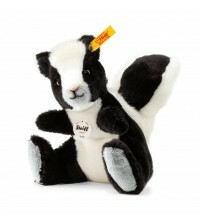 This Steiff Skunk is made for the spring 2014 collection. He is made of soft white en black woven plush. 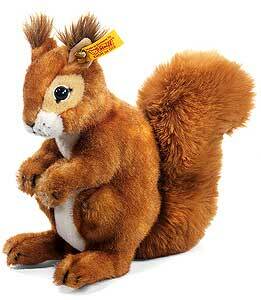 This squirrel is made in 2012. He is 21 cm. / 8.4" tall. This hedgehog is made by Steiff in 2012. He is 20 cm. / 6" tall and made out of cuddly woven fur. This fawn is made in Germany in 2010. She is 35 cm. / 14" tall. She is made out of cuddly soft plush. 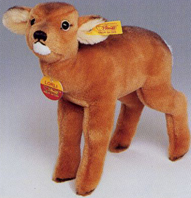 This Fawn is made in Germany in 2003.
he is made of soft brown plush. This Fox is made for the fall 2014 collection. 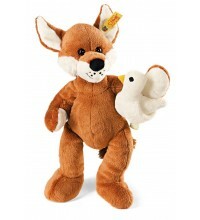 He is made of soft russet plush.